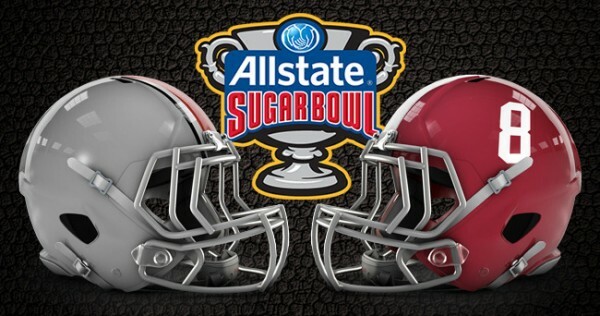 The second semifinal of the College Football Playoff will be held under the moniker of the Sugar Bowl as number one seed Alabama take on Ohio State, rekindling the old rivalry between Nick Saban and Urban Meyer while at stake will also be the pride of the conferences. ESPN, for one, is giving the Buckeyes an obscure chance of winning. Only one of their experts picking the game thinks Ohio State are going to beat Alabama. Motivation is something that can’t be measured. It might work more strongly on college kids than professionals. Urban Meyer is a master recruiter and knows how to get into the heads of the young minds he’s coaching. There are few stronger motivators than knowing that no one believes in you. Ohio State are fast on offense, which will be directed by Cardale Jones, who has just one career start, completing 12-of-17 passes in the 59-0 demolition of Wisconsin in the Big Ten championship game. Blake Sims of Alabama isn’t exactly experienced, but one full season compared to just one game is a big difference, and he’s been through quite a few ‘win or go home’ scenarios in that short time. One thing Ohio State do better is take care of the ball. They have a plus 9 turnover margin this season while Alabama are at minus 1. Ohio State are 4th in the nation this season with 21 interception, which means Sims, who isn’t exactly immune to making mistakes when he’s throwing, needs to be extra careful when throwing downfield. However, tossing the ball at Amari Cooper is still the best option he has. Cooper is the best wide receiver in the nation and now holds almost every possible receiving record for the school. He won every major possible award and has 115 receptions for 1656 yards and 14 touchdowns this season. There’s no actual way to stop him, especially not when he gets the ball (14.4 yards per catch). Making things difficult for Sims, not making it comfortable for him to throw at Cooper, is the actual best way or preventing those big plays which have been seen quite a lot this season. Ohio State have their own set of big play guys. Devin Smith is one of the fastest players in the nation and Ezekiel Elliott had a massive season with 1402 yards and 12 touchdown. It’ll be interesting to see how Ohio State, averaging 260 yards per game on the ground (11th in the nation) match up against a defense that has been prone to give up big passing plays, but allows only 88.7 rushing yards per game, and simply don’t miss tackles, having less than anyone among the power five conferences. Despite lesser SEC teams losing their bowl games, the perception that the SEC rules all hinges on Alabama carrying on their regular dominance. Ohio State (and Urban Meyer, when coaching Florida) helped build that “wisdom” of the Big Ten teams simply not matching up to SEC speed. Meyer himself has said that the changes he has and is still trying to make with the Buckeyes will be tested against the most difficult foe possible. How does this end? Alabama are the favorites. A bigger team, with probably a better defense and more experience in this kind of situation, not to mention the slight edge Saban holds over Meyer. But this isn’t the dominant, almost pro-like Crimson Tide teams of 2011 and 2012. Ohio State are better than in the last two years. They have speed, a great defensive line and linebackers crew and an offense that is an unknown quantity because of the new quarterback. This shouldn’t be a game that gets boring very soon.